I'm a newbie here and would really value your advice on a replacement espresso machine for home. My Sunbeam EM6910 is on its last legs after 15 years service. I recently replaced the steam pump but it's failing again and I'm reluctant to keep patching it up (not that I've got any more ideas on how!). I enjoy my coffee (1-2 cappuccinos per day) and love making coffee for friends and family. I'm in no way an expert or even close to snob level. I like the dual thermoblock feature of the Sunbeam but am not wedded to the brand at all. Basically I just want a machine that will make good coffee with lovely creamy froth. Ideally I'd like something reliable that will last me at least another 15 years. The market seems saturated with machines in all price ranges and I'm totally confused. Really grateful for your help. 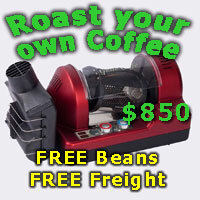 Depends on your budget, do you need a new grinder also etc? I started with an em6910 and loved it. Only really upgraded for longevity. Just steer clear of single boilers after having the dual boiler, the wait between brewing and frothing gets old. Definitely consider second hand, most machines sold here are always well cared for and you can snare a bargain. Could just shoot an enquiry to the sponsors. Antony at casa espresso sells the Oscar 2 which is great value for money. Thanks Owlee, I'm hooked on the double boiler idea and hadn't thought about second hand. Will look at the Casa Espresso site. Cheers mate. Oh and I think I'm ok for a grinder. The one I got with the EM6910 is still going strong. Hey Maarp, again, what's your budget?